If you applied multiple times (because of computer glitch, fee problem or xyz reason) then when downloading hallticket, you should use higher RID. Because higher RID corresponds to your latest application. Any news about quota for economically weaker FC? candidates that come under EWS reservation will be given 10% . Will that mean if i get sufficient marks to be in ews section and general category the result is best of the two or is that i will be considered only under ews category even if i get sufficient marks to qualify under general category?? I am appearing for the UPSC 2019 but no idea how to crack the Exam. Does EWS 10% quota will applicable? Sir pls clarify me that , now while filling the application , EWS certificate has to submit along with that or later we can submit it. Sir is it beneficial to fill with EWS category? 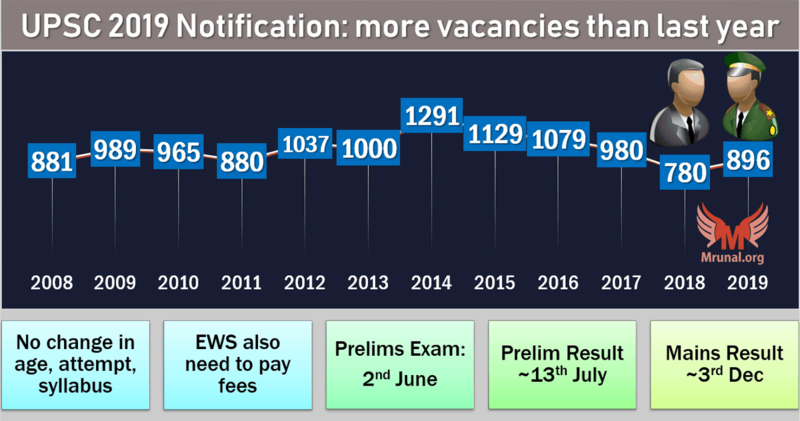 will the cutoff very high for the general category this time just because of the inclusion of EWS in the reservation criteria? will the cutoff go down for EWS in mains? My caste certificate for OBC-Non Creamy layer is dated 14052015. Can I use this or I shall get a new certificate before applying. what should I select for b pharmacy in graduation column of civil service examination application form 2019?? I applied through EWS category but there was no option to upload any EWS certficate . is it correct ? Sir , I want to know every notes in Hindi. Because I am a Hindi medium student. My optional subject is geography so plz help me. I have filled the wrong community date what should I do?? Complete article on UPSC Prelims Notification 2019. Little late to see such an informative note. Thank you sir. sir 896 me se IAS ki post kitani h ?